Last week, the arrest of MENG Wanzou made big waves in the news. Ms. Meng was arrested in Canada based on an arrest warrant issued for the United States Department of justice. Ms. Meng, as CFO of Huawei and possible heir to her father, the CEO of Huawei, is assumed to have access to substantial wealth. This led to a wave of advanced fee scams levering this news. Advance fee scams have probably been most commonly associated with "Nigerian Prince" scams. The trick is to promise substantial wealth in exchange for a relatively small advanced fee. Translation: "Hello, I am MENG Wanzou. Currently, I have been detained by Canadian customs. I have limited use of my phone. Right now CIA is trying to get me into the hands of the US government. I bribed the guard of my room, and urgently need US$2000 to get out of here. Once I am out, I will reward you 200,000 shares of Huawei. I will be good on my word. if you are single, we can also discuss the important thing in life. The guard’s name is David, the account number is 52836153836252, swift 55789034. I will be good on my word"
Of course, it is questionable how successful a crude attempt like this will be. But sadly, experience tells us that there are still people falling for the old "Nigerian scam". 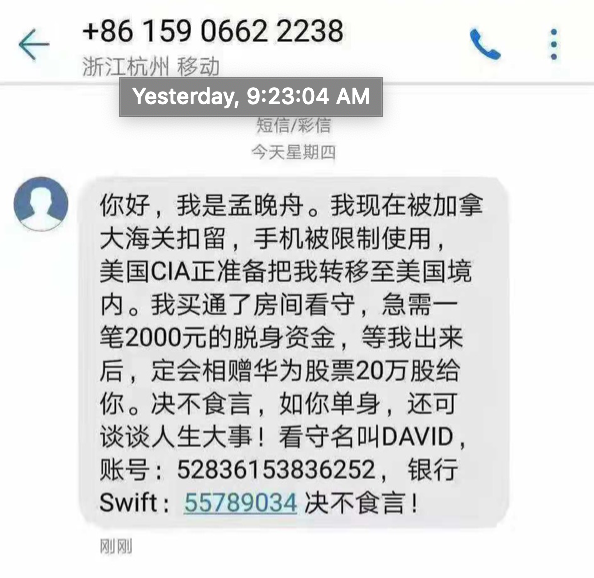 By targeting Chinese individuals via WeChat, the scam may have a higher success rate than more widely distributed scams.